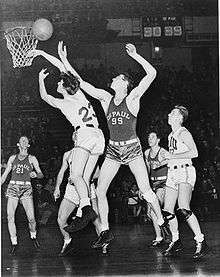 The tallest player to ever be drafted in the NBA was the 7'8" (2.33 m) Yasutaka Okayama from Japan, though he never played in the NBA. The tallest players to ever play in the NBA, at 7'7" (2.31 m), are centers Gheorghe Mureșan, and Manute Bol. Standing at 7'2" (2.18 m), Margo Dydek is the tallest player to have ever played in the WNBA. Coach John Thompson, once a seldom-used backup to Bill Russell with the Celtics, developed the Georgetown Hoyas into a chief pipeline for talent at the Center position, producing a succession of great defensive big men in Patrick Ewing, Dikembe Mutombo and Alonzo Mourning. In 1984, Georgetown, led by Patrick Ewing, defeated the University of Houston, led by Hakeem Olajuwon, to win the NCAA championship. This matchup involved the two premier Centers of their generation. The Nigerian-born Olajuwon, a former soccer goalkeeper who did not play basketball until age 15, was drafted by the Houston Rockets and paired with power forward Ralph Sampson in what was dubbed the 'Twin Towers' duo. 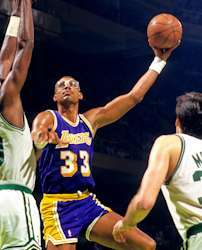 In his second season, 1985–86, the Rockets upset the Lakers in the Western Conference finals. 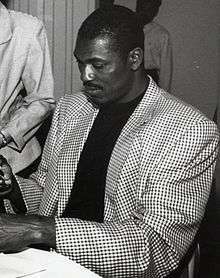 After Michael Jordan's first retirement, Olajuwon established himself as the NBA's most dominant player, leading the Rockets to two consecutive NBA championships in 1994 and 1995. In the 1993–94 season he became the only player in NBA history to win the NBA's Most Valuable Player (MVP), Defensive Player of the Year, and Finals MVP awards in the same season. In both Finals, Olajuwon outplayed two of the league's leading Centers, Patrick Ewing of the New York Knicks and the Orlando Magic's young Shaquille O'Neal. Defensively Olajuwon broke Abdul-Jabbar's career record for blocked shots. Offensively, he was best known for his 'Dream Shake', a series of fakes and spin moves regarded as the pinnacle of big man footwork. Ewing, from Jamaica by way of the Boston area, was drafted by the New York Knicks in 1985, with whom he spent fifteen of his seventeen seasons in the NBA. An eleven-time All Star, Ewing was one of the best shooting centers in NBA history, possessing a nearly unstoppable baseline jump-shot, as well as a formidable shot blocker and rebounder. Ewing never won an NBA championship, but his Knicks represented the most formidable opponents of the Michael Jordan-led Chicago Bulls dynasty in the Eastern Conference playoffs. Ewing's successor as the starting center at Georgetown, Dikembe Mutombo, who played most of his NBA career with the Denver Nuggets and Atlanta Hawks, was less adept offensively, but proved an even more dominant defender. Mutombo, who had not played basketball before arriving in the U.S. from his native Zaire on a USAID scholarship, was among the greatest shot blockers in NBA history, leading the NBA in blocked-shots five consecutive years, in the course of a career in which he ranked second in the history of the league in blocked shots, behind only Hakeem Olajuwon. He was also the recipient of four NBA Defensive Player of the Year Awards, tied for the record with Ben Wallace. The other dominant center of the early 1990s was David Robinson. Playing college ball at the United States Naval Academy, his entry into the NBA was delayed by his military service, but he unanimously won the Rookie of the Year Award in 1990 and, in 1995, was voted the MVP. Offensively, Robinson excelled in fast-breaks, running the floor like no 7-footer (2.13 m and above) before or since, while also possessing an effective left-hand jumper. Defensively, his speed and agility helped him hold the distinction of being the only player in NBA history to rank among the top five in rebounds, blocks and steals in a single season. Several European centers made an impact in the NBA in the 1990s, most notably Lithuanian Arvydas Sabonis of the Portland Trail Blazers, Serbian Vlade Divac of the Los Angeles Lakers and Sacramento Kings and Dutchman Rik Smits. In keeping with its more perimeter-oriented style of play, European basketball strategy utilized centers as playmakers more than in the NBA, and Divac and Sabonis in particular distinguished themselves as the best passing centers in the league. The 7'3" (2.20 m) Sabonis, who led the Soviet Union to an upset victory over the U.S. en route to a gold medal at the 1988 Olympics, was considered by many experts to have been among the best centers in the world in the late 1980s, but did not enter the NBA until he was well past his prime and limited by injuries. He nonetheless played seven solid seasons in Portland before returning to his homeland to finish his career. In his next-to-last season, during which he turned 39, he earned MVP honors in both of the initial two phases of the 2003–04 Euroleague with the club of his youth, Žalgiris. 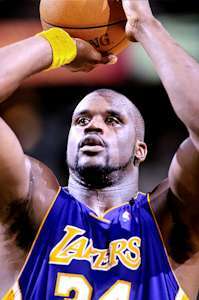 The 1992 NBA draft marked the entrance into the league of Shaquille O'Neal, who was drafted by the Orlando Magic. 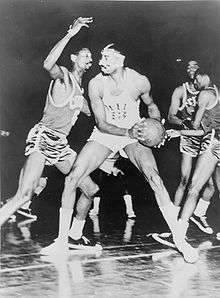 Immediately drawing comparisons to Wilt Chamberlain, the 7'1" (2.15 m), 325-pound (147 kg) O'Neal was billed as potentially the most physically dominating player ever and he quickly lived up to the hype. By his third season, he led the league in scoring and led the Magic to the NBA Finals, where they were swept by the Houston Rockets, with O'Neal out-played by the more experienced Olajuwon. After the 1995–96 season, he signed with the rebuilding Los Angeles Lakers. Former Georgetown center Alonzo Mourning, also drafted in 1992, established himself as a premier big man with the Charlotte Hornets and, later, the Miami Heat, winning two Defensive Player of the Year Awards thanks to his prolific shot blocking while also proving a reliable scoring threat. In the 1990s, an increasing number of smaller forwards, most notably Dennis Rodman and Charles Barkley, excelled at the traditional Center functions of rebounding, shot-blocking and low-post defense, anticipating a trend towards relying on shorter and quicker post players that has continued into the 2000s, as exemplified by perennial Defensive Players of the Year Ben Wallace and Ron Artest. In the fast break oriented style of offense employed by a growing number of teams, the traditional role of the Center is diminished, if not done away with altogether. Many talented big men have elected to play the more versatile power forward position, giving them more room to run the floor and play outside the paint. The best example of this is Kevin Garnett, a 7-footer (2.13 m and above) who listed his height as 6'11" (2.10 m) in order to avoid playing Center. 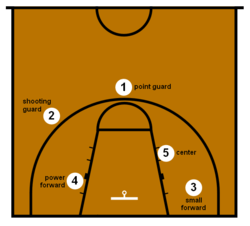 Under the influence of European basketball, the offensive role of big men has been redefined to include more emphasis on perimeter play, as exemplified by 3-point shooting big men like Dirk Nowitzki, Mehmet Okur, Andrea Bargnani and Channing Frye. The Miami Heat currently use a starting lineup not defined by position in order to take advantage of the players' versatility, with Chris Bosh and Udonis Haslem playing center instead of their natural power forward position, The Phoenix Suns also drafted Amar'e Stoudemire to support star point guard Steve Nash during 2002–2010, but in the Knicks he also starts as a Power Forward instead of a Center. The Center position has also had its downsides during the early 2000s. It started with projected NBA superstar, Mr. Georgia Basketball and High School standout Kwame Brown. He was the first overall pick in the 2001 NBA draft by the Washington Wizards. After 4 Seasons with the Wizards, he spent the next years of his career with Lakers, Grizzlies, Pistons, Bobcats, Warriors and last played for the 76ers before being waived at the start of the 2013–14 NBA season. He however became the first and only player to play with Michael Jordan and Kobe Bryant. He was considered a draft "bust", however. In the 2003 Draft, Darko Miličić was selected 2nd overall by the Detroit Pistons. He was selected before Dwayne Wade, Carmelo Anthony and Chris Bosh as well as after LeBron James. His career was considered one of the worst by a 2nd overall pick. He was however the first to win a NBA Championship with the Detroit Pistons in 2004 out of the top 5 picks. He also pursued a boxing career and later on officially retired from the NBA. The 7'6" (2.29 m) Yao Ming was drafted by the Houston Rockets with tremendous hype in 2002; possessing unprecedented shooting touch and coordination for a player of his height, many experts predicted he would revolutionize basketball. Yao proved to be a highly efficient rebounder and scorer, particularly with his mid-range jump shot, and showed the potential to be an elite defender. However, he would retire in 2011 due to a string of foot injuries that caused him to miss all but five games in his final two NBA seasons. Another heralded young prospect, Dwight Howard of the Atlanta Hawks, has used his exceptional vertical leap to become one of the top rebounders in the NBA, while his spectacular slam dunks have made him a staple of highlight reels. In women's basketball, 7'0" (2.13 m) Iuliana Semenova pioneered the center position, helping the Soviet Union women's team win two Olympic Gold medals, in 1976 and 1980, and never losing a game in international competition. Semenova also led her club team, TTT Riga to fifteen European Champion's Cup titles. The 6'8" (2.03 m) Anne Donovan led the Old Dominion University Lady Monarchs to the 1979 Association for Intercollegiate Athletics for Women championship, and was the first female Naismith College Player of the Year recipient in 1983, before enjoying a successful professional career in Japan and Italy. ↑ "Basketball: Lew's Still Loose". Time. 1967-04-14. Retrieved 2010-04-28. ↑ "Statistics: All-time leaders: Blocks". WNBA.com. Retrieved 6 December 2012.